This rug is exactly as shown; perfect fit...We absolutely LOVE it for our living room! It really brings out the other colors in the room. We DO have a pad under it, as it sits on tile. Add an eye-catching accent to any room in your home with this Colma multi-color rug. The bold pattern of this abstract rug features geometric shapes in various tones that interact to create a striking visual effect. The rug's colors look great against hardwood flooring, and its low pile height makes it a good choice to place beneath dining tables. The rug arrived yesterday. We ordered 2 of this rug. It is beautiful. The colors look exactly like the colors in the photo and match our decor perfectly. I am not sure of how it will wear since we just put both rugs down. I am rating this as a 4 because the dimensions stated (3x8) are not accurate. I had read 2 other reviews before ordering which stated the dimensions were not accurate, but I ordered the rugs anyway. When they arrived, it is true that they are not 3x8. Both rugs measured 35.5 inches wide (almost 3 feet) by 87 inches long (7ft 3in). It fits where I need it. However I feel that you should put in your description that it is only 7ft 3in long. Option: Multi 4' x 5'5"
I was very surprised at the quality of this Rug for the price. The colors are muted and fit my decor perfectly - I was worried about the blue but it is more of a grey/blue. The size is perfect under our coffee table in the living room. I would recommend! Option: Multi 5'3" x 7'6"
This rug is substantially darker than the picture (or mine is, at least), and has some color not shown. Where the picture shows an icy blue/grey color, my rug is deeper blue. Where the picture shows an ivory/beige color, mine is closer to brown. Where the picture shows brown, mine is olive. The olive is the most unexpected, as I don't see any green color in the picture at all. The pile is really low and after three days the rug hasn't "relaxed" from being rolled up. It does seem well made though and was relatively inexpensive. And regardless of the color variation from what I expected, it is still tonal with my décor, so I'm keeping it. The rug was not 3' x 8' as stated in the description. It was 2' 11" x 7' 3". This caused it to not fit properly in the area I wanted it for. 9" short is hard to correct. 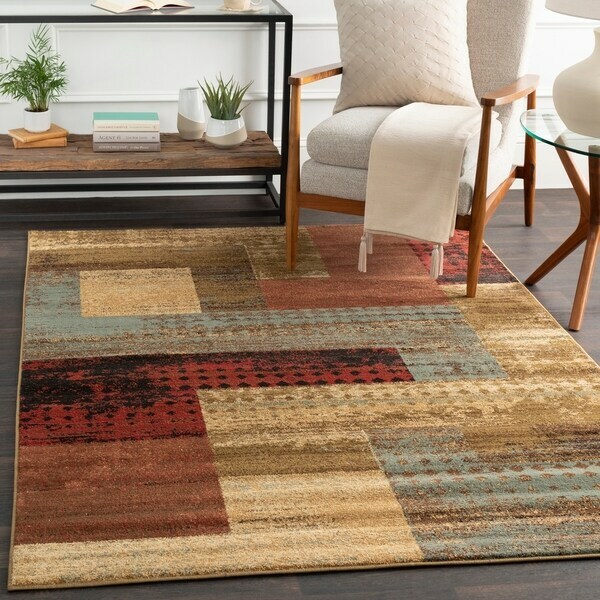 Option: Multi 7'10" x 10'10"
I had looked at this rug for weeks before I bought it, wondering if it would be one of those thin, "cheapy-type" rugs that you can't really know about until you get it. I knew it was exactly the pattern and color mix we needed so I took a chance. Wow! . . . have I been surprised (pleasantly!). It is beautiful, extremely well made, and thick enough that I don't even need to use the felt pad I ordered to go under it. We LOVE it! I really like the rug, it is very nice. Extreme liberties were taken with the size, however. I needed 8' in length. I understand a little variance. My 8' rug measures 7' 3 1/2". I don't think that is a fair approximation... disappointed. Very beautiful rug as the colors are vibrant. We are using this rug in our fifth wheel and it matches our decor and colors so well. It is well made and I would recommend this rug as it is worth the price. This is a very nice rug...the colors are muted, and they blend in very nicely with my color scheme. The rug is placed in my kitchen, and we did have to put some non-slip backing purchased at the local store. Love the rug! Option: Multi 6'6" x 9'8"
Beautiful runner. Very well made. I love all the different colors and how well they blend together. You do need to use a non skid rug pad. Very easy to vacuum. Nice texture. Amazing fast delivery! Beautiful rug for the money! I live the color and the size this is a very sturdy and beautiful area rug yes I would refer friends. Option: Multi 2' x 7'5"
Very soft! Lays on carpet comfortably without the pad that can be bought separately. Colors are as advertised. Super convenient getting it delivered all rolled up. Colors are vibrant and looked just as they did in the photos.this is the 3rd rug we have bought from Overstock.com. It was ordered for the office and is an excellent addition to the room. It goes nicely with the light shade of the wooden floor. Adds a touch of color without overdoing it. Great rug for my kitchen area and was delivered really quick. Highly recommended if for kitchen/ hallway area rug. Really soft and was as described. Option: Multi 6'6" x 9'8" | Multi 7'10" x 10'10"
I ordered this and am very happy with the size & quality of my carpet. It is soft and thick. The colors are true. Exactly what I needed. I ordered another one for a different room! Beautiful colors. I purchased this to use in the loft. I purchased smaller size and it works wonderfully. It appears to be made very well. Hopefully it will hold up well with normal wear and tear. "I want to order the area Colma area rug in Blue, however, I cannot find the runner 3' x 7.2" in Blue. Will you be getting it back in stock??? thank you in advance. " My apologies, the closest size we currently have is the 2' x 7'5". "IF IM USING THIS RUNNER ON TOP OF CARPET WILL I NEED A NON SKID PAD?" It should be fine on another rug. I use mine on laminate and it definitely needs a non-skid pad. If it's used on another carpet however, it wouldn't need one. "Does this have pink in it?" Color is subjective and may appear differently based on monitor settings. In my opinion there is a peachy color. "Do you have this in a different color"
Unfortunately, we currently do not have this pattern in a different color. However, we do offer a very wide variety of round 8-foot rugs. "what type of backing do this rug have"
"Hi. 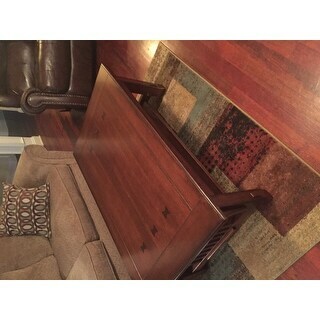 Is this rug 36" across? I know some rugs state 3" but they are actually 31" and I need 3". Thank you."